CQUniversity Australia has one of the largest and fastest-growing footprints of any university in Australia, with campuses in all major cities including Brisbane, Sydney, Melbourne and Perth and an extensive network of regional campuses across Australia. With over 35,000 students, 20+ locations and 300+ TAFE and university qualifications CQUniversity Australia is your perfect partner no matter where you are in your career. Located in the heart of the Cairns CBD near the beautiful Cairns Esplanade park lands, the multi-million dollar Cairns campus includes modern study and recreational spaces, high-tech classrooms, computer and videoconferencing facilities as well as purpose-built paramedic science, nursing and engineering labs. 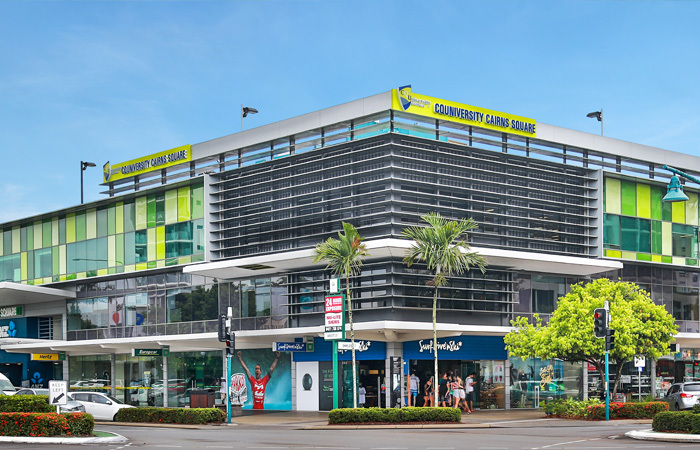 CQUniversity Australia Cairns supports a cohort of on-campus students across a range of disciplines including engineering, education, business and accounting, IT, nursing, paramedic science, professional communication, public health, tourism and creative and performing arts. The campus also offers support for the University’s extensive distance education courses including aviation, accident forensics, digital media, law, psychology, social work and many more. Our award-winning academic staff and high quality research are making an impact on the communities we serve and those around the globe. Thousands of international students from all over the world have made CQUniversity Australia their first choice, with 11 campuses offering courses in all study levels for international students, and two campuses delivering vocational training options for the trades and services industries. CQUniversity Australia continues to build our international reputation as a provider of quality education accessible to everyone. CQUniversity Australia has been named among the best universities in the worldby the prestigious and well-respected Times Higher Education World University Rankings 2016 – 17. The new ranking reflects our commitment to research, learning and teaching, international outlook as well as providing the best student experience. The Times Higher Education Young University Rankings 2016 - 2017 ranked CQUniversity Australia within the world’s top 100 universities under 50 years old. The ranking officially recognises the excellence of the world's 'young' universities. Graduates who study at CQUniversity Australia are among the highest paid in the country, and CQUniversity Australia researchers are rated as world-class in a number of disciplines, fostering a culture of success across the institution. In the QILT 2016 results, CQUniversity Australia continues to provide some of the best student outcomes in Australia, achieving a Top 4 in Australia for full-time employment (80.7 percent). We are proud of our achievements and will continue to build on these prestigious highlights. At CQUniversity Australia, we are committed to ensuring our graduates are work ready by equipping them with real-world skills and up to date industry knowledge. To strengthen that commitment, we have introduced internships for many postgraduate programs for international students. CQUniversity Australia’s scholarship program is available to support international students in all study areas at an undergraduate and postgraduate level of study. Twenty per cent of our international students are recipients of this prestigious scholarship. We encourage all international students who meet the selection criteria to apply. We believe that this aspect of financial support is a key feature in the University’s holistic provision of services to international students, and build on our strength as Australia’s most accessible and inclusive university. CQUniversity Australia's commitment to engagement and social outreach has led to CQUniversity Australia being recognised as Australia's first and only Changemaker Campus by Ashoka U, an exclusive global social innovation group, made up of only 30 other high profile education institutions across the world.